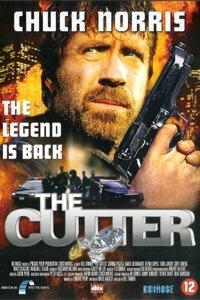 This isn't a movie about depressed teenage girls, in fact, The Cutter is an action movie starring everybody's favorite American Chuck Norris. The movie should be a no-strings-attached action flick and because it doesn't succeed at that, I can't help but be let down by it. The plot: An old diamond cutter named Isaac (Kopell) gets kidnapped by Dirk (Bernhardt) and he is put in a cell to cut a centuries-old diamond. John Shepard (Norris) is the detective who has to save him. The problem with the movie is that it tries too hard. There's some dialogue and situations involving the holocaust that hurt the flow of the movie. It's distracting. The movie's heart is the right place though. Chuck Norris does a decent job with the material he's given, but basically he's coasting. 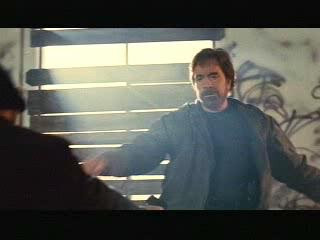 What Norris does excel at is his martial arts. We all know Chuck's pretty silly, but when you see him fight, it's still kind of exciting. There are two good fights in the film: The one on the bus and the end fight. The only problem is that the action is cut too fast to see, but you can make out Norris and not a stunt double (most of the time). 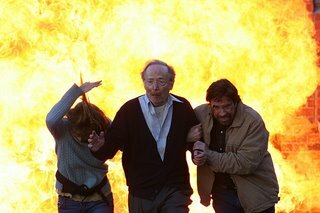 The movie in a nutshell is a 90 minute "Walker, Texas Ranger" episode but with more explosions.